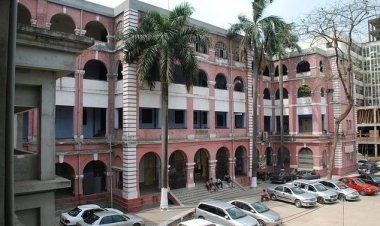 Sir Salimullah Medical College was established in 1875 as Dhaka Medical School in the old part of Dhaka city. Mitford hospital was a part of the school. Sixteen local kings and philanthropists helped in erecting the medical school building in 1889. Admission in Sir Salimullah Medical College Admission under SAARC Free quota student must need 95 percent in HSC And SSC With 99 percentage in Biology. The school was made a medical college in 1962. To acknowledge the contributions of the Nawabs, the college was named after Nawab Sir Salimullah (1871-1915). Until 1957 the License of Medical Faculty (LMF) degree was offered from this college. During 1963-1972 condensed courses for MBBS degree was offered. In 1972 it was upgraded as a full-fledged medical college and the first batch students for MBBS degree enrolled in 1973. The civil surgeon of Dhaka was in charge of both the college and the hospital until 1974, when a principal and a superintendent were appointed for the institutions. The superintendent was made the director of the hospital in 1984. The medical college consists of following departments: preclinical (anatomy, physiology, biochemistry, pharmacology), paraclinical (pathology, microbiology, forensic medicine, community medicine, pharmacology), clinical medicine (general medicine, psychiatry, neuromedicine, nephrology, cadiology, sexual-skin-and-venereal diseases), pediatrics, surgery (general surgery, orthopedic surgery, pediatric surgery, neurosurgery, cardiothoracic surgery), gynaecology and obstetrics, ophthalmology, otolaryngorhinology, anesthesiology and diagnostic (clinical laboratory, radiology and imaging). The medical college possesses a 600-bed general hospital including OPD and IPD services in the above disciplines and an integrated emergency department. 175 students with pre-medical A-level education are admitted each year through open competitive examination for undergraduates. Students are awarded undergraduate MBBS degree after five years’ study in college and hospital and three professional examinations (first after 1.5 years, second after 3.5 years and final after 5 years of admission) under the University of Dhaka. Then, they do one year full residency training in the hospital to get registration for practicing medicine. It is one of the most prestigious medical college in South Asia. The undergraduate program of this college is recognized by General Medical Council of UK. Mitford Hospital, established in 1820, named after Sir Robert Mitford, collector of Dhaka and a long-serving judge of the Provincial Court of Appeal. During his time, there was an alarming cholera epidemic; at the height of it 150 to 200 persons died daily in Dhaka. Medical facilities were inadequate. Mitford was distressed to see the suffering of the people. Before his death in England in 1836, he bequeathed the bulk of his property (about Rs 800,000) to the government of Bengal for benevolent works in Dhaka including building of a hospital. This was disputed by his successors but finally, in 1850, the Chancery Court partially decreed in favour of the Bengal government, by virtue of which it received Rs 166,000. With this fund the hospital was started in 1854 on its present site, then known as ‘Katra Pakurtali’, Babu Bazar. Before this, the site was occupied by a Dutch kuthi (house). This was the first general hospital of the eastern part of undivided British ruled Bengal. From the inception, the hospital was under the administration of a board accountable to Dhaka municipality. A women’s ward was established in the hospital in 1882 with generous donations from Nawab Khwaza Ahsanullah of Dhaka and Raja Rajendra Narayan Roy of Bhawal. Nawab Ahsanullah also donated Rs 50,000 to set up Lady Dufferin Hospital within the same compound in 1888-89. A European ward was established in the hospital in 1887, and in 1889-90 Raja Srinath Roy of Bhaggyakul set up an eye ward at a cost of Rs 3,00,000 in memory of his mother. It got the recognition of a first grade hospital in 1917. The hospital, in addition to its wards, accommodated lecture halls, dissecting rooms, and an outpatient department. The hospital provides general as well as specialized services. It is a tertiary level hospital in the hierarchy of health in Bangladesh. It occupies an oblong area of about 12.8 acres (52,000 m2) of land on the river bank and the hospital complex comprises more than 14 blocks of no particular architectural significance but historically important and eventually of utilitarian character. Most of the blocks were originally single-storied and now have been raised four- to 10-stories. The hospital provides indoor and outdoor treatments as well as pathological and diagnostic services. It serves about 2,500 outdoor patients daily. Though as of 1999, the hospital had 600 beds (of which 240 are paying) but more than 1000 indoor patient remain in the hospital most of the time.